Mixed Threads is a lively marketplace—and an important forum—for next-generation designers and entrepreneurs who celebrate street fashion and aesthetics. Pittsburgh’s trendiest lifestyle and street wear designers join forces to present their newest collections, including FarESH Brand, The Homestead Renaissance, Native 412, and more. 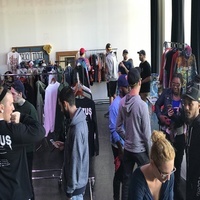 With DJs, live music and local food vendors, Mixed Threads invites you to spend the afternoon meeting visionary creatives and young entrepreneurs from across the city, and offers an opportunity to pick up extra-hip new gear, direct from the source.